In many contemporary churches today, traditional liturgy has fallen out of use in favor of a more modern style of worship and fellowship. One reason this may be happening is because churches have tried mimicking society and popular culture in an attempt to attract a younger generation. While this may be valid, Rev. Suz Cate believes that there is inherent value of liturgy, specifically the The Book of Common Prayer, not only in corporate worship but also in personal spiritual development. As the eighteenth rector of Holy Trinity Episcopal Church in Clemson, South Carolina, Rev. Suzanne Cate has played an important role in organizing and leading liturgical worship in her church since June of 2016, and before that she was assistant rector in Charlotte, North Carolina and Ormond Beach, Florida. 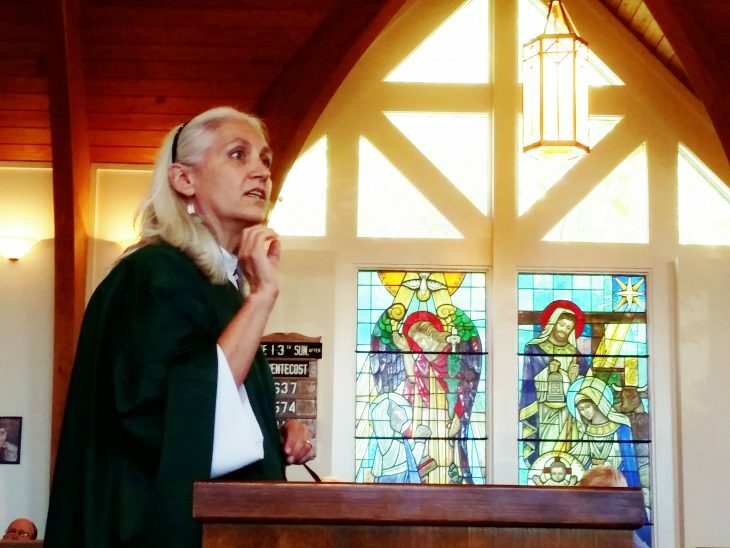 She was invited to share with the Carolina Institute for Faith and Culture about the use of The Book of Common Prayer in the church and personal devotions. Rev. Suz began her presentation by leading a noonday prayer from the Book of Common Prayer, as it was appropriate for the time of day. Afterwards, she pointed out that simply by looking at the edge of the Book of Common Prayer, a person can tell which section of the literature is most used; upon observing, there is a noticeable stripe of worn pages down the middle of the book. Rev. Suz explained that this stripe is where the Holy Eucharist is located. The Holy Eucharist is the liturgy of the book that is used on the Lord’s day for fellowship and worship of some traditional churches. It consists of set scripture reading, prayers, hymns, and sacraments for the church to partake in together, including communion. This is the most worn portion of the Book of Common Prayer because it is used on a weekly basis when people come to church, while other sections of the book are used for more particular purposes which will be discussed later. The practice of using the Book of Common Prayer regularly in church has several benefits, one of which is predictability. If liturgical church-goers find themselves away from their home church and attend another one, there is a strong chance that there will be a sense of familiarity regarding the organization of the church and service. As implied in the name, the Book of Common Prayer creates a common factor between Christians who use it and includes them in a larger sense of church unity and, perhaps, a truer feeling of connectedness to the “Body of Christ”. Beyond unity in churches, using the Book of Common Prayer on a corporate level also emphasizes the consistency and unchanging character of God. When liturgy is used during services, people memorize prayers and scripture without even trying, and the structure is created to constantly remind people of who God is and the promises in the Bible. There is also a liturgical calendar that the church follows, using different literature for different seasons such as Easter and Christmas. Rev. Suz Cate appreciates the liturgical calendar because it is another defense of the church from being influenced by secular culture. The Book of Common Prayer, however, is not restricted to use on the Lord’s day with the Holy Eucharist. Also included in the Book of Common Prayer are daily prayers that can be said throughout the day and structures for certain rites and services that occur in the church. Examples of these are for baptisms, confirmations, marriages, and deaths, of which the Book of Common Prayer outlines scripture, prayers, and curriculum to give structure to celebration of momentous stages of life. There are also topical prayers, such as prayers for birthdays or for the sick. These kinds of resources can give Christians the words and insight to speak where their own words cannot, especially in times of severe hardship or loss. It provides an anchor to point back to scripture and God in our lives rather than the world. Another helpful tool located in the Book of Common Prayer is the Catechism, or the Outline of the Faith. This section of the book, located near the back, is a long series of questions (and answers!) about Christianity, God, faith, scripture, and many other theological topics. This is an incredible gold nugget for Christians who are sharing God’s love with their friends when someone begins to ask them the tough questions of faith. After all, most Christians aren’t thoroughly prepared apologists; the Book of Common Prayer can help people reconcile logic and faith. One of the greatest criticisms of liturgical churches now is that using liturgy de-personalizes the relationship between people and God. When asked about this, Rev. Suz Cate gave a very insightful answer to this common misconception. She emphasized that using liturgy and tradition in church and personal devotions isn’t something that needs to be done as Christians; Christians aren’t better or worse than other Christians if they do or don’t use the Book of Common Prayer. However, it helps some connect with God and others in a way that can’t be reached without liturgy, and the special sense of tradition is something they want to cherish. There is a community built between Christians and God, and it is a steady light in a dark world. Rev. Suz mentioned that she does her daily morning prayers with her husband using the Book of Common Prayer. This is an awesome example of what a healthy marriage looks like by including God in the relationship, and if that is achieved via liturgical prayer and devotions, should we not encourage and embrace that as Christians? Rev. Suz also brought up the idea of what we pray becoming what we believe, and that in repeating prayers that state what Christians believe, that reinforces those beliefs and affirms them. All of this is not to say that Christians need to use the Book of Common Prayer every week in their churches and every day in their personal lives. Christians should, however, be more open-minded to the idea of using liturgy to strengthen their relationship with God. There is, after all, only one way to truly know what the Book of Common Prayer is and the effect it has: read it.